We both grew up on Hans Christian Andersen and Grimm Brother’s fairy tales. Those fairy tales not only made us use our imaginations and had interesting stories, but we also feel that they had good teaching moments and morals. We believe that we need more books with beautiful, quality and positive thinking, so we decided to write one! With this book, we have tried to provide easy reference tools that can be used to teach important fundamentals in life, such as setting goals, gratitude, always looking for the positive side of things, and to have a happy, loving life through strong family bonds. It is essential for everyone to understand these fundamentals from an early age and that we use our imaginations to keep the magic in our lives. We hope this book will help you to do this. 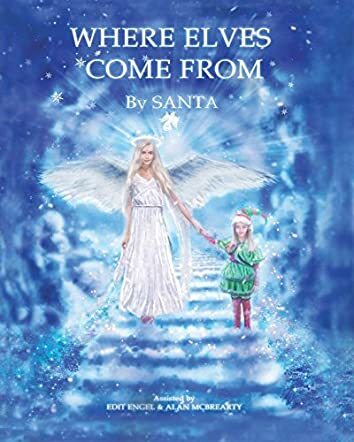 Where Elves Come From by Santa, Edit Engel, and Alan McBrearty is a beautiful fairytale with some lovely messages for young readers that will make them aware of life, the experiences it teaches, and the fundamentals such as setting goals, always looking for the positive side of things, gratitude, and to have a happy, loving life through strong family bonds. Five-year-old Suzy meets Anna at the City Park and they become friends. Anna’s father can see the beginning of a great friendship between the two girls. It is love at first sight for Anna’s and Suzy’s parents and they soon become a happy, loving family that cares for each other. Their joy turns to sadness when Anna is diagnosed with cancer. Set against the backdrop of the Christmas season, the story has sixteen chapters which have a moral at the end of each. The story has magic and real life events knitted together, making it an enchanting read. The illustrations capture the beauty and essence of the Christmas season and bring the characters and the scenes alive. There are a lot of good messages children can learn from this story, hence making it a good bedtime storybook and ideal for read aloud and story-telling sessions in classrooms and school libraries. The book is educational yet fun to read. The pain and sorrow of the family are palpable and it is a heartwarming story of gratitude, trust, friendship, love, family bonding, faith, and courage. The mystery of the elves towards the end of the story gives a whimsical feel to the book. The elves, the sparkle of the Christmas season, and the celebration mood make it a fascinating read for everyone. Must read for all ages! I think this book is going to be a new Christmas classic. I bought this book for my niece; she loves storybooks. Before I gave it to her, I had some alone time, and I decided to read a few chapters from the book. I could not put it down! It is a very relatable and enjoyable story, and of course, now I want to know the end. I now look forward to reading it with my niece. I highly recommend this book to everybody! We loved the book. Beautiful story! Highly recommended for all ages, kids, and adults also. I enjoyed as much as my kids did, each one of us got a little emotional when reading it. Such beautiful message and full of never-ending surprises. We will read it a few more times. Can't wait for the next book. Suzy and Anna’s family completely took our hearts. Santa also has many moral lessons in every chapter. This book has many positive values for kids. I enjoyed the book as much as my children did. Where Elves Come From has 16 very nice short stories, and at the end of the book, it all comes together. Must read to all kids. I would recommend this book to everybody who has children and even to teachers for reading in their schools. It touched our hearts deeply. It made us cry, and it made us laugh. Where Elves Come From has wonderful messages for children, and it also has very cute nighttime prayers. Santa leaves the readers with short messages at the end of each chapter that make for great teachable inspirational and moral lessons that also make for great family discussions. Highly recommended for everybody. What a wonderful Christmas book. A great way to introduce cancer and death to children and focus on important people in our life. I don’t usually write reviews, but this book truly touched my heart. It is a remarkable family-oriented book with a beautiful, yet unpredictable story. Although the main subject of the book is very serious and discusses cancer and death, somehow, because it is written by “Santa”, the book surprised us with it’s very cute and uplifting story full of hope. Over 16 short chapters, the family will capture your hearts as they take you with them on through interesting adventures and share with you some wonderful messages, gorgeous illustrations, positive morals, and even a few bedtime prayers that you can enjoy with the kids. The story teaches us that it is important always to be grateful for all we have, and that we are never too old to believe in a little magic. I “really, really” enjoyed this book and recommended it to everybody.